The Academy Awaird for Best Supportin Actor is an awaird presented annually bi the Academy of Motion Picture Arts and Sciences (AMPAS). It is gien in honour o an actor wha haes delivered an ootstaundin performance in a supportin role while wirkin within the film industry. Walter Brennan wis the first winner in this category for 1936's Come and Get It; He wad an aa win for his roles in Kentucky (1938) an The Westerner (1940). Van Heflin wan in 1942 for his performance in Johnny Eager. George Sanders wan for his role in 1950's All About Eve. Karl Malden wan in 1951 for A Streetcar Named Desire. Anthony Quinn wan this category twice for Viva Zapata! (1952) an Lust for Life (1956). Frank Sinatra wan in 1953 for his role in From Here to Eternity. 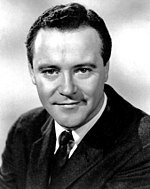 Jack Lemmon wan for his performance in 1955's Mister Roberts. Red Buttons wan for his performance in 1957's Sayonara. Peter Ustinov wis nominated three times in this category winnin twice for Spartacus (1960) an Topkapi (1964). Ed Begley wan this awaird for his role in Sweet Bird of Youth (1962). John Mills wan for his role in 1970's Ryan's Daughter. For his role as the Master of Ceremonies in Cabaret, Joel Grey won this awaird in 1972, acomin ane of aicht individuals to win baith an Oscar an a Tony Awaird for the same role. George Burns wan for his performance in The Sunshine Boys. (1975). Jason Robards wan twa consecutive awairds in 1976 an 1977 for his roles in All the President's Men an Julia. Christopher Walken earned twa nominations in this category resultin in a win for his performance in The Deer Hunter (1978). At age 20, Timothy Hutton acame the youngest winner in this category for his role as Conrad Jarrett in the 1980 film Ordinary People. Louis Gossett Jr. wan in 1982 for his performance in An Officer and a Gentleman, acomin the first black actor to win in this category. Michael Caine wan this awaird twice in 1986 an 1999 for his roles in Hannah and Her Sisters an The Cider House Rules respectively. 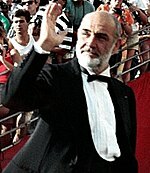 Sean Connery wan for his role in 1987's The Untouchables. Kevin Kline wan for his role in A Fish Called Wanda (1988). Tommy Lee Jones wan in 1993 for his performance in The Fugitive. Martin Landau wan for his role as Bela Lugosi in Ed Wood (1994). Kevin Spacey wan in 1995 for his performance in The Usual Suspects. Cuba Gooding Jr. wan for his role in Jerry Maguire (1996). Robin Williams wan in 1997 for his performance in Good Will Hunting. 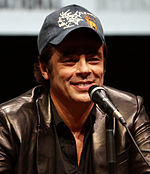 Benicio del Toro wan for his role in 2000's Traffic. Jim Broadbent wan for his performance in 2001's Iris. George Clooney wan this awaird in 2005 for his role Syriana. Javier Bardem wan in 2007 for his performance in No Country for Old Men. 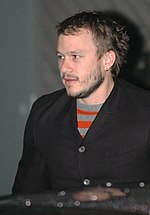 Heath Ledger wan posthumously for his role as The Joker in The Dark Knight (2008). Christian Bale wan in 2010 for his performance as Dicky Eklund in The Fighter. At age 82, Christopher Plummer acame the auldest actin Oscar winner in 2011 for his performance in Beginners. 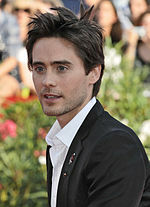 Jared Leto wan in 2013 for his performance in Dallas Buyers Club. 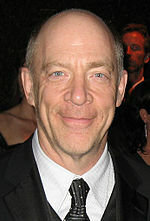 J. K. Simmons wan for his role in Whiplash (2014). Mark Rylance wan for portrayin Rudolf Abel in Bridge of Spies (2015). Mahershala Ali wan for his role in Moonlight (2016). ↑ O'Neil, Tom (October 8, 2008). "Can Frank Langella win an Oscar and a Tony in the same year too?". Los Angeles Times. Tribune Publishing. Retrieved May 8, 2015. ↑ "The 90th Academy Awards (2018) Nominees and Winners". Academy of Motion Picture Arts and Sciences (AMPAS). Retrieved March 4, 2018.